My competitive holsters, from 1993 to present. About a week ago, I was asked by Walt in PA about the magazine holders I use for USPSA competition. I told him that I have been using the standard Glock Magazine Holder ever since I got into competition, for a number of reasons. First, it’s what I use for every day carry, if I use a mag holder. Second, it’s lightweight and cheap. So cheap, I’ve never found anything else that meets my needs, for the price. While my choice of mag holder hasn’t changed, I can’t say the same about my holsters. The picture above shows my competitive holster collection, as it has evolved from 1993 to today. When I bought my first Glock 17 in 1992, I went that same weekend and bought a very inexpensive nylon, one-size-fits-all holster, and I used that holster for club competition for about 3 or 4 years. It’s made by Gould & Goodrich, and I don’t know the model number because that part of the tag is missing now. The inside is a nice suede. When I took up IDPA in 1995, I bought an Uncle Mike’s Kydex paddle holster. Because I carried my gun at about 4 o’clock at that time, I adjusted it to the maximum forward cant that I could. I still use it for IDPA. At that time, I used a stiff leather belt, laced through my belt loops, as a gun belt. 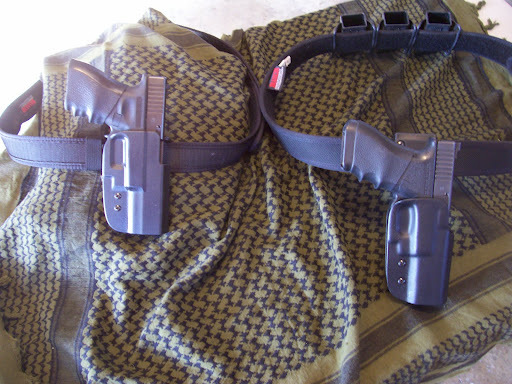 Then, in 2002, when I took up USPSA, I changed from a 4 o’clock position to a 3 o’clock position, right on my hip, and I bought an Uncle Mike’s belt slide holster. About that time, I found a Bianchi competition belt on sale, and I started using that. I like the competition belt because it’s a little more rigid than the leather belt, and I can take the belt off and on a lot easier. In 2005 or so, I started experimenting some with my draw stroke, and I changed my technique a little. Before, I moved my hand below the gun and swept it clear with the fingers, then grabbed the grip as I brought the gun to bear. However, I found that this technique didn’t yield a consistent grip, so I changed, so that my first movement was to grip the gun with my strong hand, high, with a good shooting grip. Then I would draw the gun, while bringing my support hand in. I found that the belt holster made the gun ride just a little too high, and someone suggested I try an offset holster, that mounted the gun lower. 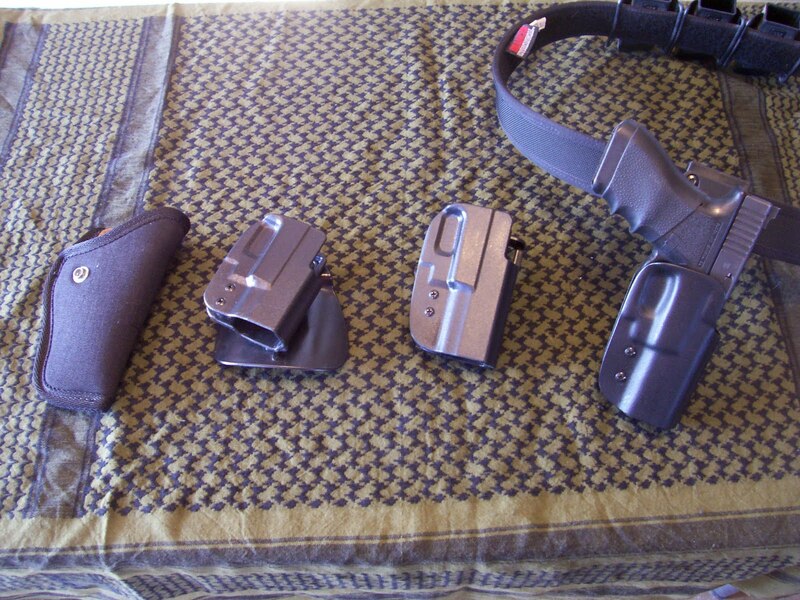 Uncle Mike’s belt slide holster, left, versus BladeTech DOH holster, on the right. Note that both belts are at the same level. The gun rides almost 3 inches higher with the belt slide holster. I ended up buying a BladeTech “DOH” double offset belt holster, that’s adjustable for cant at two points. After some experimenting, I have it set at a neutral position, not canted in any direction. I wear it right behind by the point of my hip bone, per the Production Division rules. I find that the 3 inch difference between the belt slide holster and the DOH is enough to make my grip a lot more consistent. Yes, I still have all these holsters, and many more. But that collection is for another day. I recently made the switch from a Smith & Wesson M&P as my USPSA Production gun to a Glock 17. I was very happy with my old holster, which is a Fobus Evolution, so I think I am going to purchase one for the Glock.The magazine pouches are where I had some trouble. My setup was a mix n' match, of sorts. I picked up an iTac paddle style pouch that served me well. My only complaint was that it took up a lot of room on my belt (paddle plus it was a double mag pouch). I also picked up a Blackhawk double Magazine Pouch that I had mixed feelings about.The Glock magazines don't fit in either so I'm going to have to pick up mag pouches to hold 4 magazines on my belt. I'll have to check out the Standard Glock Magazine Holder. Thanks for sharing.